Vedomosti’s Aleksey Nikolskiy published an informative piece on Monday. He says the announced deal for the first two Mistral helicopter carriers, built in France, includes spare parts and training for a grand total of €1.3 billion (52 billion rubles). The deal reportedly includes the option to build two more units in a Russian shipyard. While the deal’s sealed, the final contract is still being worked between France’s DCNS and Russia’s OSK. 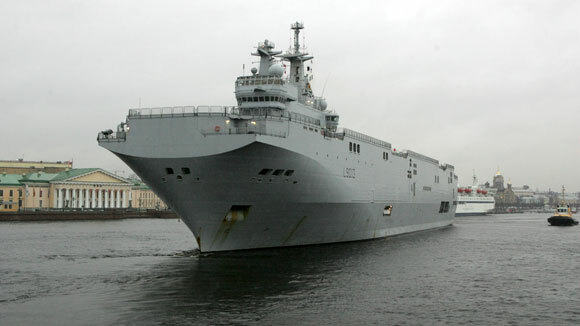 Nikolskiy said the Elysee website said the Mistral package would provide 4 years of work for 1,000 French shipbuilders (5 million man-hours) at STX in Saint-Nazaire. Paris is selling Moscow the SENIT 9 combat information system aboard Mistral, but apparently without license rights. The contract for unit one is worth €700 million, and €600 million for unit two. OSK maintains Russia will get a 20 percent share of the work on unit one, fabricating some sections for the ship in Russia. Its share of the work on the second unit could be more, according to analyst Mikhail Barabanov. An OSK representative told Nikolskiy the main goal of this deal is to get modern technology, and a possible Russian builder for the optional units hasn’t been determined. And he repeats General Staff Chief Makarov’s statement from June that the first Mistral will go to the Pacific Fleet to transport forces where they might be needed, particularly the Kuril Islands. 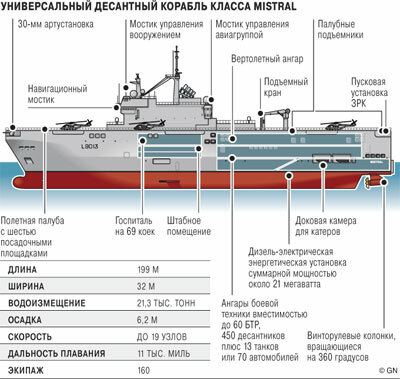 Of course, you can generally double these alternative purchases if Russia builds a third and fourth Mistral. Is the Helicopter Carrier Tender for Real? He indicated Russia is talking about two ships. He also welcomed the French builders of the Mistral to join in the tender. The tender will take place next month, and the winning bid will be selected before year’s end. After months of negotiations with France on building Mistral-class amphibious assault ships, the Russians couldn’t reach agreement on the terms of a deal. The two sides may have agreed on building two ships in France’s STX shipyard. French President Sarkozy told its workers last month they’d be building two ships with the Russians. Maybe the Russians wanted to buy one and build three, but Serdyukov says the international tender is for two ships, so it seems likely Paris and Moscow had agreed on a ‘2+2’ formula. So something else is probably the sticking point. RIA Novosti suggests talks with Paris stalled over its unwillingness to sell Moscow the NATO standard tactical communications system aboard Mistral, according to an unnamed expert who spoke to Ouest-France. Officially, the Elysee says negotiations with Russia continue, it’s confident of a successful outcome, and it isn’t worried about the Russian tender. It hasn’t commented on participating in it either. Meanwhile, the French media claims Moscow has stopped its exclusive talks with Paris.